This comes from a fascinating article in the June 21st issue of The Economist about what drives attachment. Simply put, endowment effect suggests that once someone owns something he places a higher value on it than he did when he acquired it. In a ingenious experiment, students were reluctant to trade a coffee mug for a bar of chocolate even though they did not prefer mugs to chocolate when given a straight choice between the two. The experiment was repeated with primates with similar results. When presented with a choice, 60% of chimps preferred peanut butter to frozen juice bars. However, when they were endowed with peanut butter, 80% of them chose to keep it instead of exchanging it for fruit bars. Our evolutionary past may explain it. Giving things up, even when an apparently fair exchange seems to be on offer, was just too risky. These days there are contracts, rights and other ways of enforcing bargains. Animal societies have none of these mechanisms. In a brain scanning study carried out recently (using functional MRIs) the pattern and location of activity observed suggests the endowment effect works by enhancing the salience of loss. If this is true, it suggests that a shrewd tendency persists even though we have evolved our culture and environment to where we no longer need to rely on it. I can only imagine the searches that this posting will turn up in elsewhere, given the title it has, no doubt of disappointment to most readers. When it comes to brands making statements about us, there are a couple of ways to interpret them. The first is that they serve as nothing more that confirmation; of something we already know and believe. At OFD we take a different anthropological interpretation. Such statements are valued precisely because we don't ourselves believe them and being confronted with the idea gives us a permission to believe that we can't find our way to on our own. At first glance, it seems faintly absurd and rather arrogant that a brand - any brand - would be so presumptuous to tell us we are unique. How can a brand know us after all? On the other hand, it is precisely because so many people don't feel special that being told we are is so appreciated. 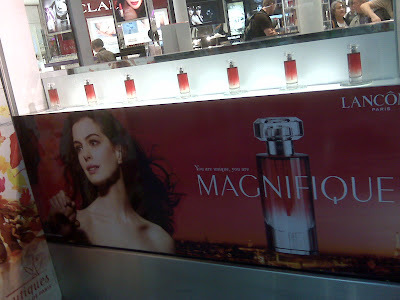 Affirming our worth makes us feel good and makes us feel warm and fuzzy about what is showering us with affection, in this case a brand called Magnifique. L'Oreal has gone as far actually referring to worth in the platitude is directs to women: Because You're Worth It. While insecurity is bad for people it is, in a sense, good for marketers for it creates an urgent, self-directed need for resolution across a number of aspects of people's lives and how they define themselves. The needs are not latent, rather they are very pressing because they are concerned with issues that matter to us a great deal: whether we are successful, whether we are beautiful or handsome, whether we are good parents or not, to name a few. This served up by Ad Age today, affirming that blogs and other on-line content are indeed not favorable to AIG, in part due to the company continuing to promote its strength at a time when in was in question. AIG has been touting its strength for a long time. 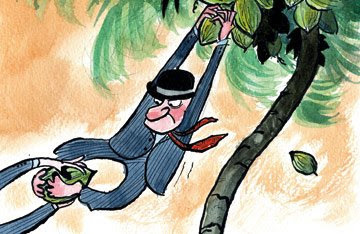 It's not surprising that the web is alight with the irony of AIG's bail out by the Fed. 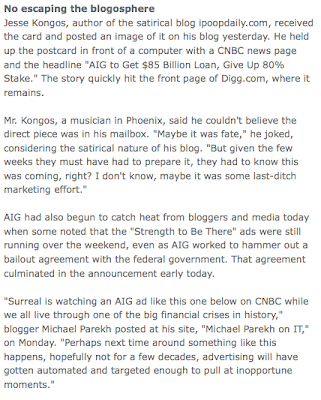 The Consumerist is only one site enjoying that reckoning that AIG is facing, whose commercials seem shockingly brazen given this recent news. AIG is not alone. There are plenty of corporations that play a dangerous game indeed; their Houses NOT in order they continue to shape perceptions in a wholly different manner, oblivious - or arrogant - to the new consequences of the transparent age in we which we live, with the surfacing of inconsistencies that will emerge through fuller, freer distribution of information. We have William Caxton to thank in 1476 for the first major revolution in free-thought. He developed the printing press which allowed the spread of ideas in written form, which expanded discussion and conjecture and the quality of thinking with it. We have the internet (at least web 2.0's incarnation) to thank for further dramatically shifting control of debate and distribution of ideas out of the hands of 'producers' to ordinary people.